The word “caliphate” often conjures images of Islamic extremism, but a growing population of young and globally engaged Muslims are reclaiming the term. In the face of active crises involving Muslims, such as the recent mosque attack in New Zealand, a free, public lecture titled “Who Wants a Caliphate?” will shed light on diametrically opposed Western and Islamic perspectives and offer a vision for a path forward. The Imam Khattab Lecture on Islamic Thought will take place Tuesday, April 16, at 7 p.m. in the Law Center McQuade Auditorium. 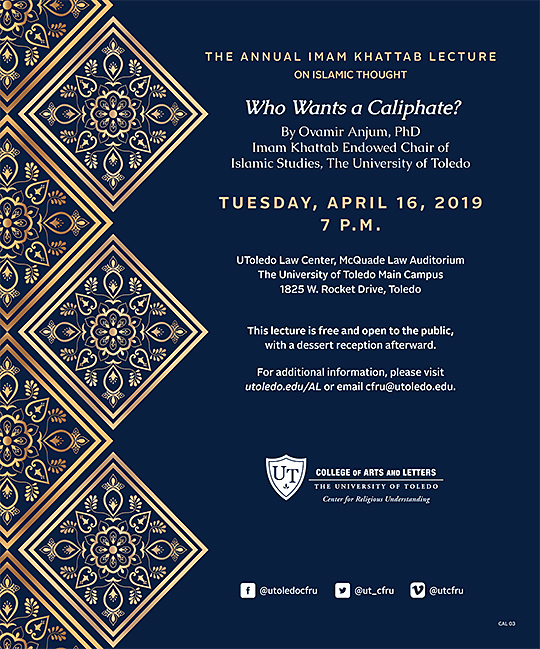 Dr. Ovamir Anjum, UToledo Imam Khattab Endowed Chair of Islamic Studies, will explore how the connotation of “caliphate” is evolving to represent a more progressive Muslim world. “I hope attendees of the lecture will take away new ways to think about the past and the future of Islam-West relations, and, in general, how to think about the rising global struggle between nativism and globalism,” Anjum said. The annual Imam Khattab Lecture on Islamic Thought encourages dialogue about the Muslim experience through both historical and contemporary contexts. The event is part of the Center for Religious Understanding’s lecture series and expands on the center’s mission to promote a deeper understanding of religion on campus and throughout greater Toledo. RSVPs are appreciated: Go to the College of Arts and Letters’ website. This entry was posted on Thursday, April 11th, 2019 at 3:55 am and is filed under Arts and Letters, Events, UToday .